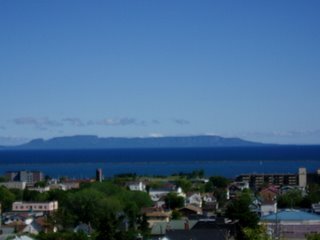 The Sleeping Giant is a land formation in Lake Superior that was formed upon the betrayal of Nanna Bijou, the Spirit of the Deep Sea Water. Nanna Bijou had told the Ojibway people of a tunnel that led to the center of a rich silver mine. However, he warned that if the Ojibway tribe were ever to reveal its whereabouts to the white man, he, Nanna Bijou, would be turned to stone. Through trickery by the Sioux, and then by white men, the mine was eventually discovered. When that occurred, Nanna Bijou turned to stone and blocked the entrance for all. I love stories like this. Although we didn’t do so, I believe you can actually travel to the island and Sleeping Giant Park. I think Thunder Bay, at least for Char and me, is worth a return visit some day.